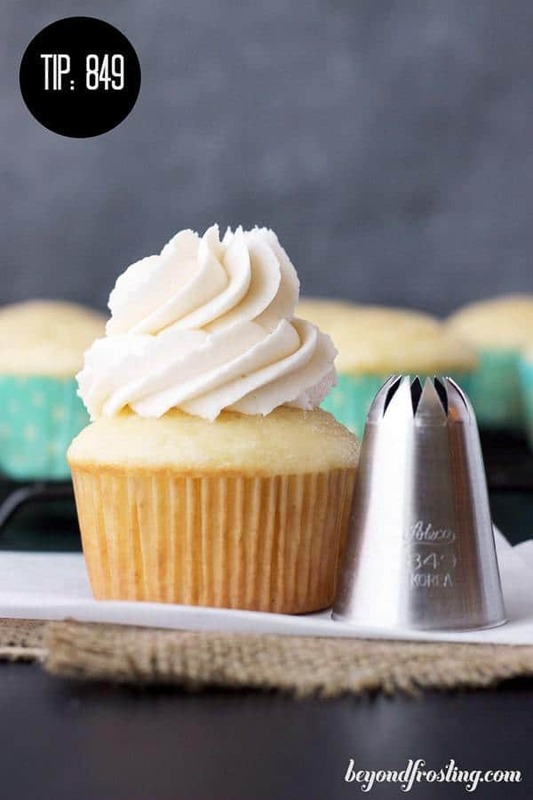 This Cupcake Piping Tutorial will show you the different types of piping tips you can use and how to decorate the perfect cupcakes just like a bakery style cupcake! 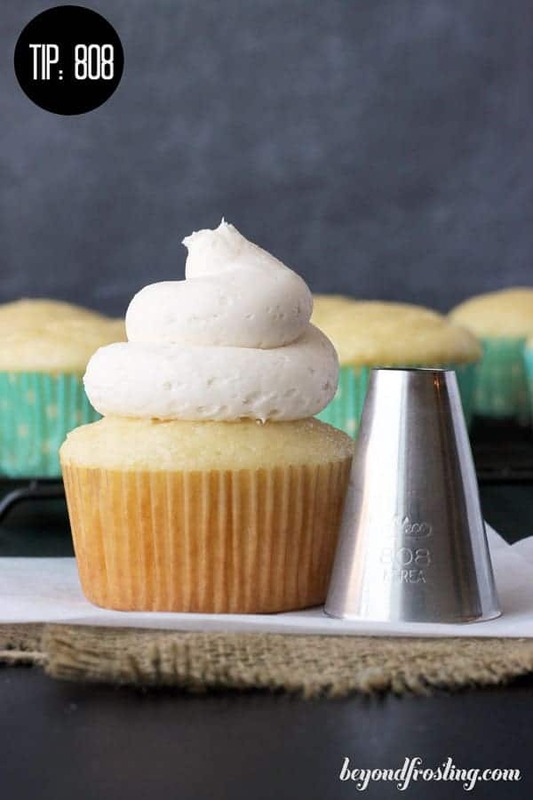 Frosting a cupcake can be a little daunting if you have never done it before. Let me tell you that it’s really not as hard as your think. 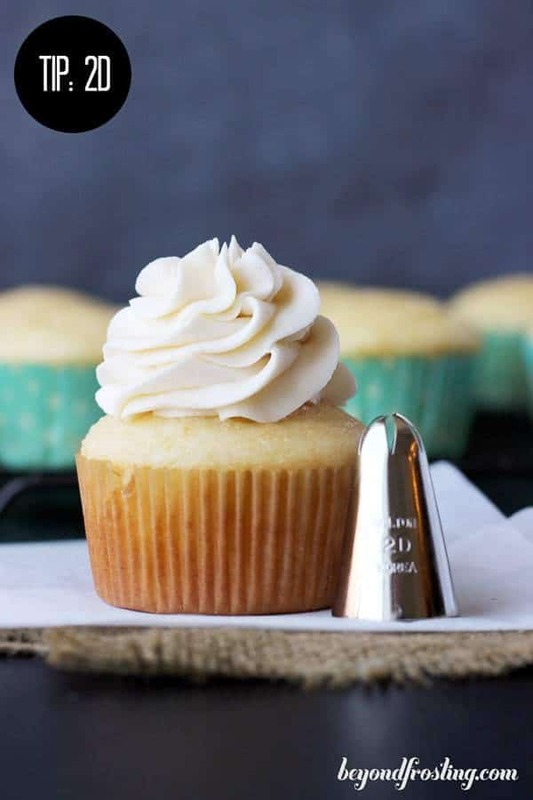 There are 3 key factors to frost a cupcake: pressure, position, motion and certainly a good frosting! With a little bit of practice and the proper tools, anyone can do it. 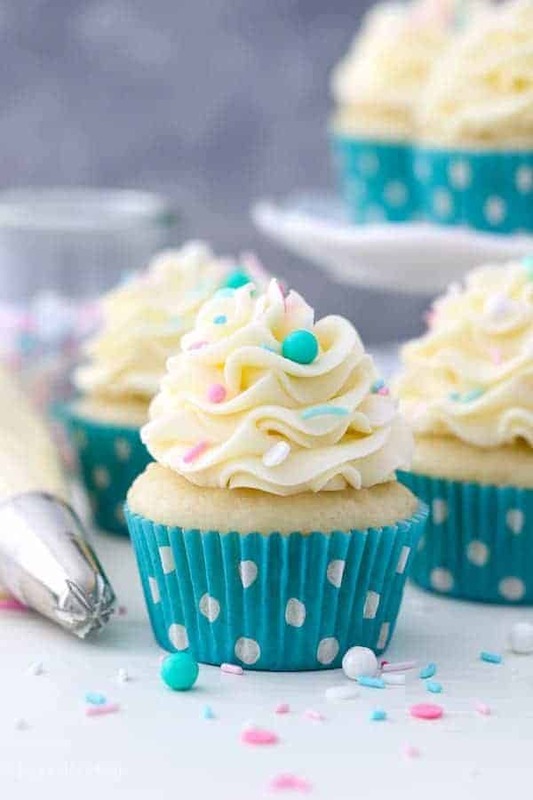 That’s right, you can learn how to decorate the perfect cupcake! 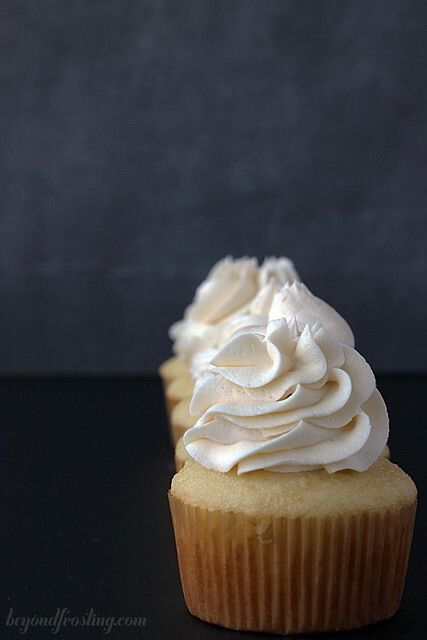 On Monday I shared my Perfect Vanilla Buttercream. It is whipped to perfection and full of flavor! 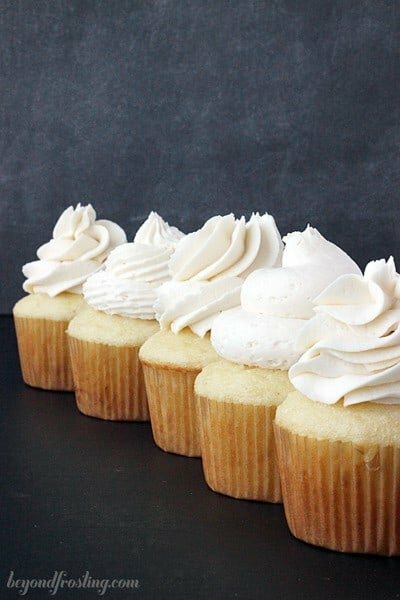 I thought this piping tutorial deserved it’s own post, but it is the frosting recipe I used in this post. 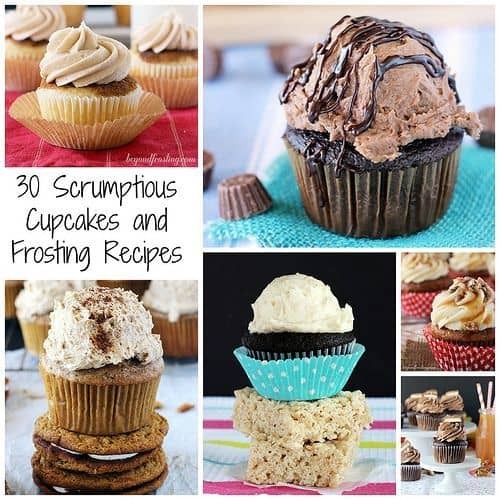 Scroll to the bottom of this post for more frosting recipes! What I have found that helps me the most, is using a large piping bag. I use an 18″ Disposable Pastry Bag . First of all, the large piping bags allows you to put all the frosting in the bag without having to refill, because that gets messy. Once filled, lay it flat and push all the frosting down the bag and try and get out any remaining air bubbles. Twist the end of the bag shut. Sometimes it helps to put a rubber band around it. I like to use Wilton Icing Bag Ties , but a rubber band works too! Take note in the above photo that I cut the piping bag very close to the end of the tip, which helps prevent the frosting from exploding out of the bottom of the bag. Nobody likes that. Make sure you cut it high enough that it doesn’t block any of the points on the piping tip. In order to have a consistent shape, you need consistent pressure on the bag. 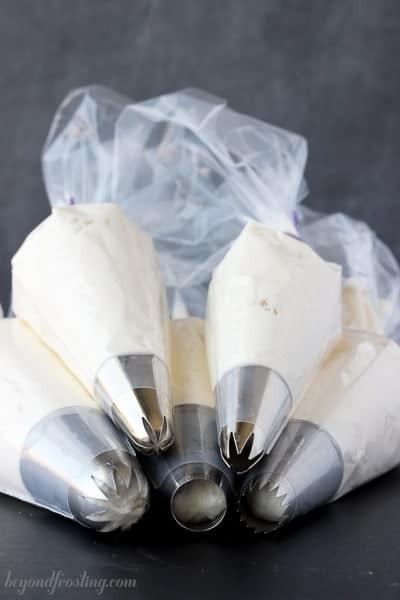 The larger piping bag allows you enough room to hold the bag both at the top and above piping tip, which is key to being able to apply equal pressure on the bag. The larger bags are usual more sturdy which is important when it’s so full of frosting! 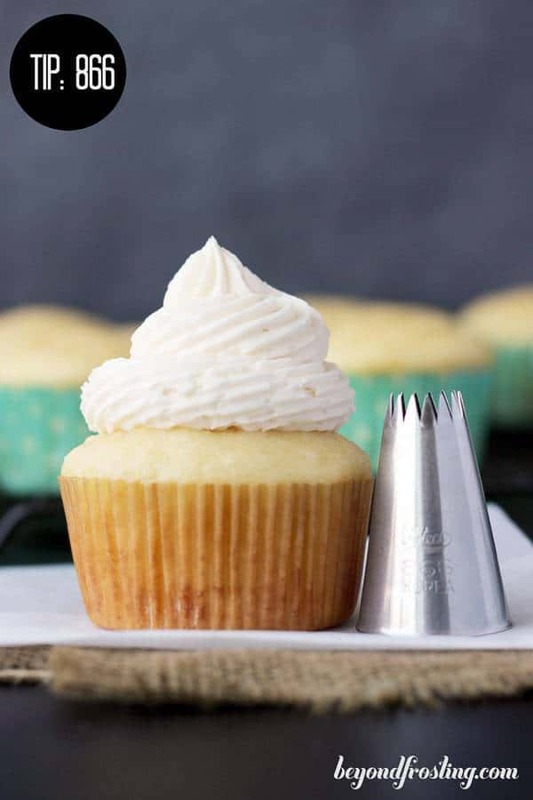 When positioning the piping bag, you should have you hands over top of the cupcake and hold it at a 90 degree angle. 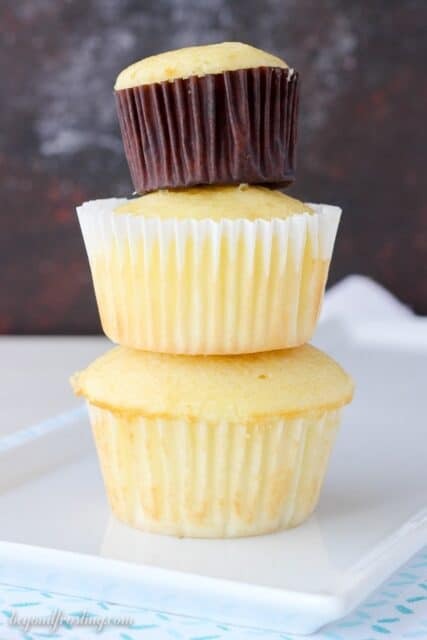 Position the tip over the top of the cupcake and swirl from the outside working your way in as you lift up the bag. 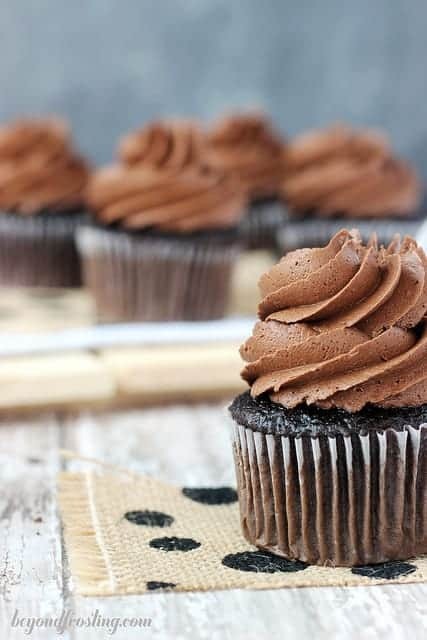 When I started making cupcakes, I was getting frustrated because the piping tips did not produce the same results that I would find in the cupcake stores and blogs I followed. 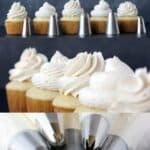 I read different posts about piping cupcakes and everyone talked about large piping tips. I purchased some of these piping tips and let me tell you it changed my life. If you don’t live near a cake supply store, they can be difficult to find. Your local craft store might carry some and of course you can buy them online. I would recommend buying Ateco 6-Piece Pastry Tube and Tips Set the as a starting place. If you don’t need all 6, I included links to the individual piping tips I used below. For some of my favorites, I brought two of them. Let’s dig into each of the different decorator tips you can use! This tip, 849, is my favorite. In fact, I own three of these tips and use them all the time. It is the one that reminds me most of an old fashioned cupcake. It works with most types of frostings except those that have stuff in them like nuts. This tip can be used for a beautiful whipped cream on a pie or cake. It works great for both light and dense frostings. Buy it here. Tip 2D: This is a gorgeous tip for piping. It is commonly found in craft and baking stores. It works best with light frostings like Swiss meringue and whipped cream. 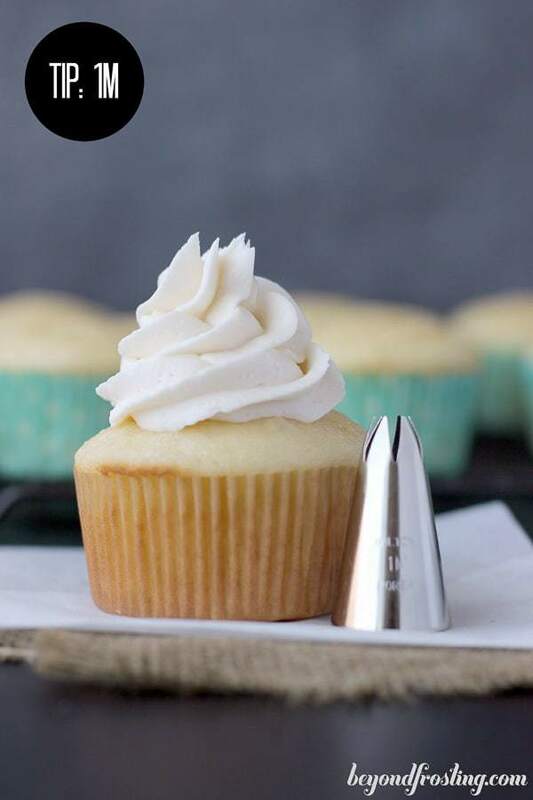 If you have any type of fillings in your frosting, this is not the tip for you. It will get easily caught in the tip leaving you with a less than pleasing look. Buy it here . The 1M piping tip is another star tip. You will notice it is a smaller version of the 849 tip. It creates a tighter swirl of frosting. 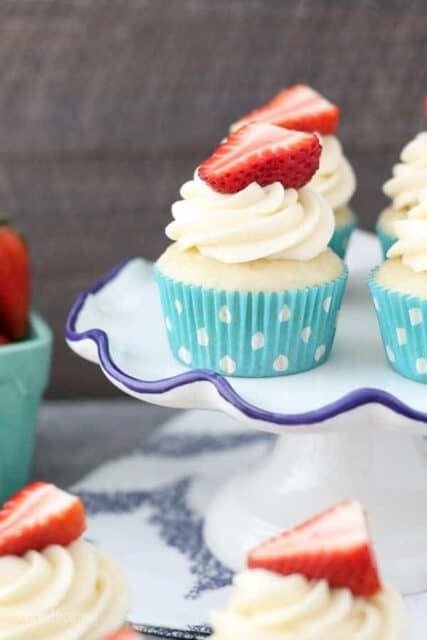 This tip also works well for light frostings like Swiss meringue and whipped cream or stiff cream cheese. As with the previous tip, it is best to avoid using this with any frostings that have fillings like coconut or candy. Buy it here . Piping Tip 808: This tip holds a special place in my tool belt. I don’t use it often, and I am usually selective with what I use it for. It’s great if you have a frosting that has stuff in it like coconut or Oreos. The opening is large enough where the fillings won’t get stuck. The 808 is one of the wider versions of this tip, its about a 5/8″ opening. I usually find this tip in a cake store or buy it online. You can usually find a smaller version in a craft store. Buy it here. 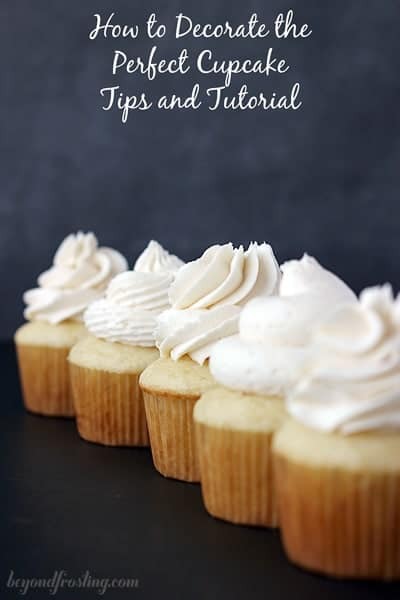 Visit my tips and techniques page for more tutorials along with my Pinterest boards for more inspiration for Cupcake and frosting ! 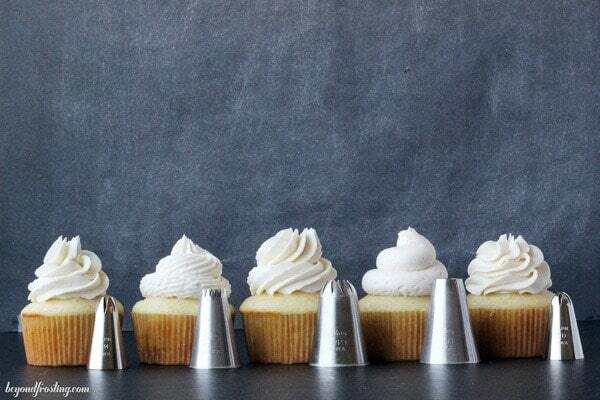 I also have a pretty detailed post about cupcake pan sizes and the corresponding baking times. 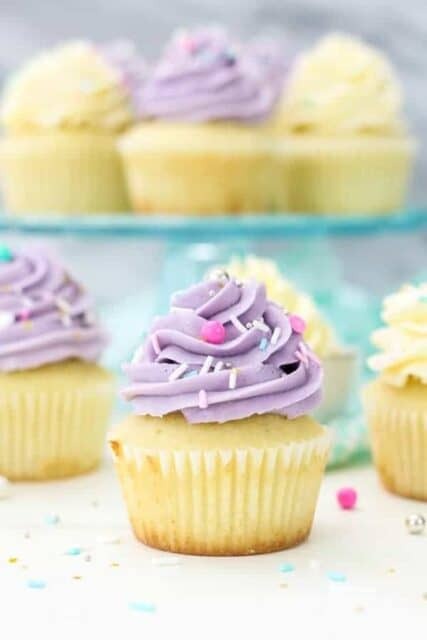 Check out my Cupcake Baking Tips. Want more of my favorite baking tool? I’ve got you covered! Everyone asks me where I buy my bright cupcake liners. My favorite shop is Shop Sweets and Treats. Other recipes that might help you! I wanted to thank you for going over some tips for decorating a cupcake. I didn’t know it could help to have a rubber band around the frosting bag to make sure the bag doesn’t have any air bubbles in it. It seems important to have really tight bands regardless to help prevent air bubbles. You’re welcome Taylor! I’d say I use them both ways, but mostly I think it helps keep the bag nice and shaped so I don’t have to worry it unraveling as I am working, especially if you are working with multiple colors say when you are decorating cookies or something. Love this tutorial, you make it look sooo easy! Thanks I bookmarked this post for future reference. A perfect and detailed tutorial. Your frosting is so beautiful ! I totally needed this tutorial Julianne – you are SO amazing! Pinned!